You know what this photo brings to mind? It looks like an extended hand! Imagine: a proper Southern lady (or maybe New York City socialite?) gives her hand to a gentleman. “Chaa-aarmed,” she says, as the gentleman graces the back of her palm with a kiss. I’m no Southern lady, of course. No, no! I’m the type of lady who commandeers her neighbor’s fence for a photo shoot. 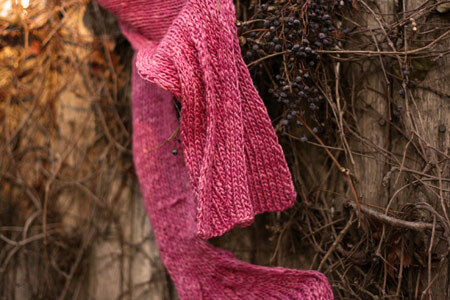 Pattern: Drifting Pleats from Knitting New Scarves by Lynne Barr (review/preview here). Yarn: Single-Dyed Phat Silk Phat from La Lana Wools; 50% wool / 50% silk in Raspberry (I think), 3 skeins. A lovely gift from my friend Barbara. Needles: Bryspun double-pointed and straight needles, US 8. Definitely a great match for this yarn! Size: about 4.5″ wide and 63″ long. 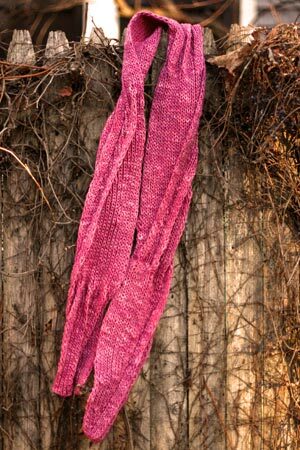 In addition, this scarf is very plump and thick, since it’s 1×1 ribbing at its core. Can you see the smoothness on the left compared with the bumpiness on the right? Just adds to the scarf’s interest, I say! The pattern is genius and mind-blowingly simple in its design. Actually, all of the patterns in this book make so much sense despite apparent three-dimensional complexity. Props to Ms. Lynne for envisioning the structures and developing the techniques to bring them to life! The wrong side of the scarf is as interesting as the right side. Because the scarf is basically ribbed, there’s absolutely no curling. The pleats start out as little pockets, then wrap around the edge and disappear into the background. Very cool. The whole concept is very cool, I’d say, and this is definitely not my last scarf from this book ! love the pink – the colour really lends itself to the pattern! That really did turn out super fabulous. I love the high-browedness of this scarf. You captured it perfectly! Just lovely! And I put my money where mouth is. My book is on its way. Can’t wait! So gorgeous! Love the colour and the pattern. The light and colours and warmth in those photos is just divine! Makes me feel all snug and winter-y. They even have berries, for crying out loud! And the scarf is lovely too of course, definitely shown off to best advantage. The scarf is beautiful and I love that shade of pink. The last picture is wonderful. What a beautiful scarf! Thanks so much for introducing me to “Knitting New Scarves.” I took it out of the library, fell in love, and put it at the top of the list of knitting books to purchase! my friend bought a copy of this, and i’m insanely jealous! i’m seriously tempted to borrow it from her, as the library is being a slowpoke about getting the book in! The scarf looks warm and snuggly; the pleats are fascinating. Great combo in a knit! So amazingly beautiful! I’ve been waiting to see this scarf ever since you posted about it. The colors and design go perfectly together! I totally have to knit it! 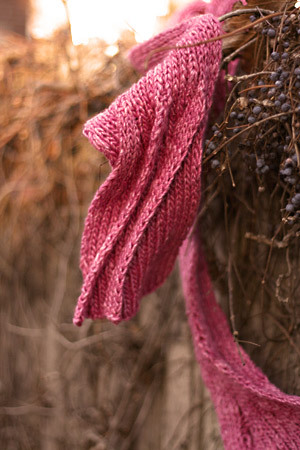 Wow – makes me want to knit a scarf. I don’t like knitting scarves. Absolutley beautiful!! Very nice – great photos! I’m glad you posted a good view of the finished project, because I was having trouble identifying its beauty in the incomplete phases. But you are right, it’s a great scarf and the pattern looks fun. I even have some purple silk blend yarn that might want to become one of those! Thanks for documenting it so well. You sure finished that quickly! And wow, it’s lovely. I think the yarn was an excellent match for the pattern. Thanks for sharing your adventures with this scarf. It’s beautiful! I was looking through my copy of Knitting New Scarves last night and there are several I want to try, mainly because the knitting technique looks so fascinating. I’m not sure I’d actually wear most of the scarves (many do not look like they would be very comfortable) but they certainly make wonderful conversation pieces and they definitely qualify as knitting sculptures worthy of prominent display. Oh, how neat! I’ll have to take a look through this book at my LYS. I like your yarn selection, too – lovely color and texture. I think you picked a great yarn for this — the sheen of the silk really shows off the ridges of the pleats. Beautiful work! Arrrggghhh! I had the book in my hands, yesterday, and looked and this pattern, because of your post about it the other day. I looked at the technique, and I thought it looked complicated. . . I’m going back for the book! I love the scarf! The scarf looks great, but I want to know which one you’re going to do next! Oh, it’s just gorgeous! And what a fun photo shoot showing it off. That book is #1 on my wish list. I’d love to see this in person. 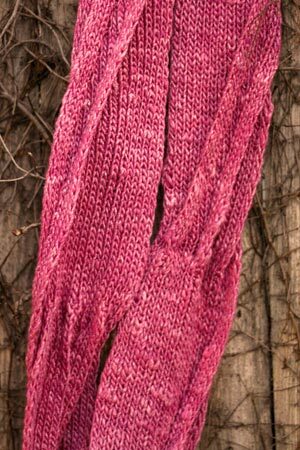 The scarf is really lovely & the effect of the pattern is gorgeous. Love the color! What a beautiful project you’ve made! I’m glad you found the right project for the yarn, and this turned out so specially interesting. I was walking down one aisle of the Market at Stitches West 2006 and saw a flash of pink out of the corner of my eye. I stopped, focused, and immediately heard it call your name. 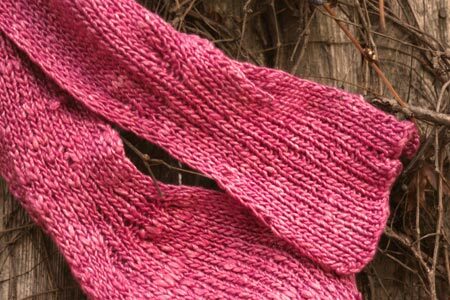 It’s a pleasure to give to someone like you who appreciates the unusual feel of hand-spun yarns. Hugs!! I’m usually not a fan of pink colour, but this is gorgeous!! I am so buying this book for myself for Christmas! Love the scarf. Gorgeous gorgeous scarf and photos! The pink on that rustic brown fence is perfect. The shots themselves are gorgeous, too. I have to ask–have you gotten a new camera, or what kind of camera did you use on these and the gray replacement shawl photos? The depth of field looks fantastic. That is my favorite yarn. I’ve used it once. I loved it. I lost the scarf I made with it and someday I’ll make another. Besides, I just loved Taos.